After damage calculation, if this card attacks a Defense Position monster your opponent controls: Destroy all Defense Position monsters your opponent controls. During your End Phase: Destroy all other monsters you control that did not declare an attack this turn. This card must be face-up on the field to activate and to resolve this effect. Hard to believe it has been 10 years since Synchro Summoning has been introduced into the game. Back at the beginning of the year, I came up with this idea to do the Top 10 Synchro Monsters of all time around the time the Synchro mechanic was first introduced a decade ago, so this will end around the time the 2008 Starter Deck came out 10 years ago. Starting off our countdown is one of the first Synchro Monsters. First released in its respective Wave 1 Tin in 2008, we have Red Dragon Archfiend. RDA is a Level 8 DARK Dragon Synchro with 3000 ATK and 2000 DEF requiring one Tuner and one or more non-Tuners. Easy summoning requirements to meet, Level 8 is easy to summon. 3000 ATK is nice, 2000 DEF is acceptable. DARK and Dragon is a good type/attribute combination. After damage calculation, if this card attacks a Defense Position monster, you destroy all Defense Position monsters your opponent controls. This can really punish your opponent if they play on the defensive by destroying several monsters, though Link Monsters cannot exist in Defense Position. The problem now is that when your opponent is playing defensive in modern Yu-Gi-Oh, it is probably because you are already winning and they are just stalling for as much time as possible. Red Dragon Archfiend is good for killing defenses, but a problem it has is that it punishes you if you aren’t offensive enough. During your End Phase, any monster that did not attack this turn is destroyed, no matter what position it is. You can stop this from happening by getting rid of the Red Dragon Archfiend, but if not you better attack with everything you have or you can kiss it goodbye. In modern Yu-Gi-Oh, players play offensively and with limited Extra Deck space, Red Dragon Archfiend struggles to find a spot in Extra Decks. Maybe if a stun deck that plays very defensively with monsters comes, Red Dragon Archfiend can come out to wreck havoc. Back in 2008, this was honestly a pretty good card considering the lack of options there was. Probably during it’s prime it would of been a 4/5 or a 4.25/5 cause it was a great first Synchro, but this isn’t 2008/2009 anymore. It is ok in modern times, just not as staple as it was a decade ago. Art: 4.5/5 Hard to pick my favorite Signer Dragon artwork. Synchro Week on CoTD to celebrate Synchros Anniversary of coming into the game, and we start it off with an old favorite. Red Dragon Archfiend was one of the major Synchros to hit the game and change the landscape. Easy Level 8 to make, this beater punished a field that chose to play defensive, popping all monsters in defense on your opponents side of the field. This was a huge board-wipe potential all for choosing to attack like normal. Yes, you had the drawback of having to attack with all your monsters, and if you Special Summoned/Normal Summoned/Set a monster in Main Phase 2, it would be destroyed by RDA, but that was okay, because RDA was a 3000ATK wrecking machine. Archetypes like Gravekeers and Ghostricks were really put to a disadvantage with this card. RDA also provided a new out against walls like Spirit Reaper and Marshmallon, instead of wasting a board-wipe card or a singular targeting card. 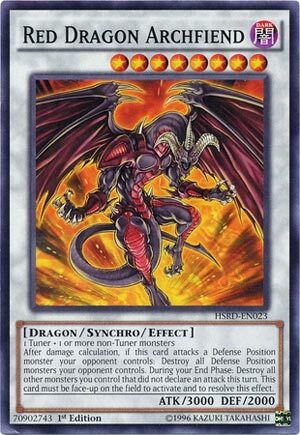 Red Dragon Archfiend hasn’t seen much play for a while with the advent of Xyz and Link monsters, but it still holds a spot in paving the way for Synchros. Synchros were the reason the Fusion Deck became known as the Extra Deck about 10 years ago. Since then, most knew types of cards have existed there instead of the Main Deck. I think I’ll feel old when Link Monsters are 10 years old, but I digress. Red Dragon Archfiend is a generic Level 10 Dark Dragon-type Synchro Monster with 3000 Atk and 2000 Def. Any 1 tuner and 1 or more non-tuners could make this. If you were lucky enough you could field wipe the opponent with this card’s effect alone. Just attack and everything in Def position on your opponent’s side is destroyed. As a drawback, Red Dragon Archfiend also destroys any of your monsters that didn’t declare an attack during your turn. Nowadays, some monsters cannot exist in Def position and other monsters are immune to destruction, so RDA hasn’t seen much play. But that can change as soon as we get a monster that can only exist in Def position or more cards are released that allow for Synchro Climbing into RDA evolutions. Until then, Red Dragon Archfiend is an easy beater with some nice effects that may or may not work currently. Score: 3.75/5 Art: 4.5/5 Hot RDA or Abyss might be my favorite RDA artwork. Welcome to the Top 10 Synchros of Yugioh countdown! Over the next two weeks, to celebrate Synchros having been in the game for 10 years, we’ll be counting down the 10 best from the game, as voted by us and averaged for you. **Prelude–I haven’t seen the whole list yet (at the time I’m typing this, I see this and #9) but I’m going to post the link from the old CotD for any review(s) any card on the list may have. Partly for nostalgia, partly cause I’m the Grandpa here, and have been doing this long enough I probably am the only one to have reviewed most whatever shows up here. I’m going to try and make these reviews compare and contrast, and the scores will be given in that manner as well. I wrote about this not too long ago, but Synchro, as game changing as it was for the game, was more or less, just a new take on the Fusion (or even Ritual) mechanic. Not needed a specific Fusion card (of your choice) or Ritual Magic card, but a specific type of Monster, obviously, Tuners. Red Dragon Archfiend is a tremendous, yet unwieldy power. A strong Synchro, too, of course, with his 3000 attack. Dark and Dragon are both very well supported. When Synchros first came out, you saw lots of him. His destruction effect, on top of the attack of his own, is incredible. It can/could backfire, and destroy some of your Monsters as well, if played against properly. It probably could be a reasonably viable card in a Dragon Deck (assuming you can make the Level 8 Synchro of course) given all they have in their arsenal these days. It hasn’t withstood the test of time (in my opinion) as well as some other Synchro Monsters have, but I wouldn’t at all say he’s unplayable. Previous articleHex Maniac – Pokemon New Ban List Week!